Our company pursues hommization working environment and has designed unique powerful noiseless system which can implement working at a low noise as 55dB (A) 20-25dB (A) lower than the open type product. It is the first choice product for labs, dentists, households, industry and the places which require particular quietness. 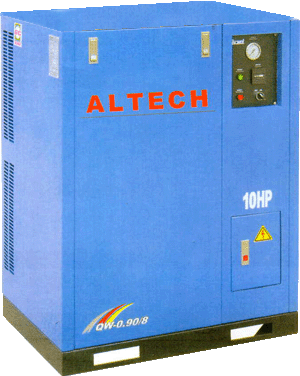 Besides, the unique cooling system assures the clear quality of compressed air. A. Adopting full-automatic apparatus, easy control and easy operation. Gold-plated profile painted with micro-meritics, attractive and durable B. Simple structure assures a high quality with less maintenance, safe and reliable. The unique function of auto-stop can detect the application state of the compressed air. As the quantity of compressed air reduces and reaches the rated pressure the pressure switch is knocked off automatically and the working stops; as the quantity of the compressed air increases, the pressure switch controlled automatically will start working again. The system can work under the condition of energy conservation. The special ladder supporting structure of motor is convenient for adjusting the degree of tightness of tightness of the V-shaped belt between the headpiece and the motor so that the compressor can bring into full play.